While you can run apps on Wear OS, the main reason for it to exist is to serve notifications. But for as much as notifications are useful, too many can be counterproductive. 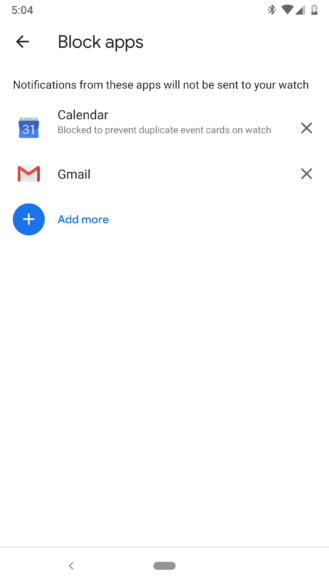 If you're finding that one or more of your apps is getting too noisy, but you're not quite ready to shut down notifications altogether, one good solution is to block those notifications from reaching your watch. Soon, you'll be able to access the settings screen to configure blocked apps by using a launcher shortcut. In the way of evidence, this one is pretty straightforward. A new line in the Android Manifest combined with a new XML file with a shortcut listed is a big obvious sign. The only shortcut listed in there is pointing to a screen that allows you to pick apps that should be blocked from Wear, or rather, the notifications produced by those apps. Despite the simplicity of an app shortcut, this one isn't live yet. The shortcut is defined and everything is there, but it looks like the app is just preventing itself from displaying anything. It seems odd to hold back a fairly straightforward shortcut, but it will obviously become available soon. This might be a very simple feature addition, being that it's just a shortcut from the launcher to a screen that already existed, but it's probably the most logical shortcut to have. Some users may actually change their block list frequently to account for periods of particularly spammy notifications from otherwise reasonable apps. At the very least, I can't think of any other screen or feature of Android Wear that's more deserving of an app shortcut, so this is probably the best one to add if one is going to be added at all.